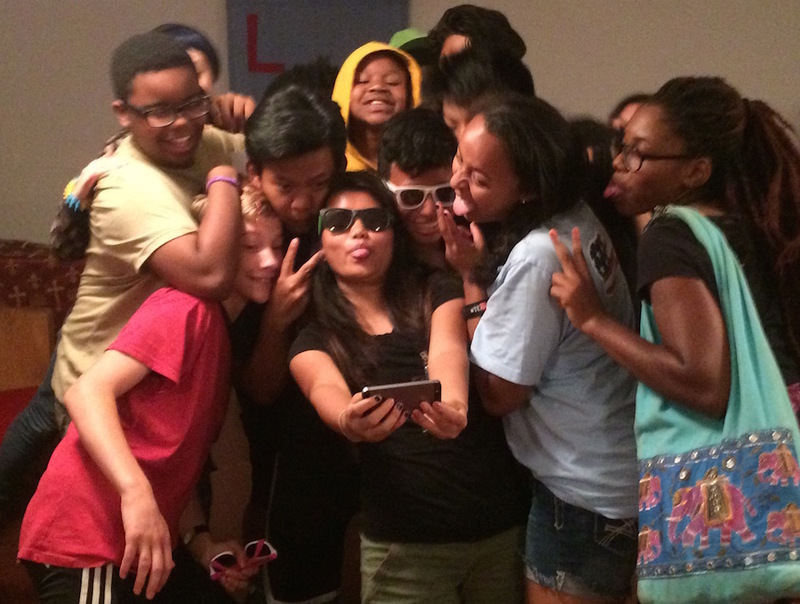 Campers take a group selfie after the talent show. I got to participate in the Peacebuilders Camp talent show tonight and was impressed by the talent, but was even more moved by how caring and supportive the group was. When I was a teen, talent shows were always so scary. Whenever I was on stage, I felt like a spotlight was shining on all the ways I was different or awkward or vulnerable. But I never experienced a talent show like this one. Despite the fact that – on the surface – the kids in this group are incredibly different, they celebrated their differences and applauded even louder when peers were vulnerable. A 14-year-old boy sang and did an interpretive dance to “The Circle of Life” by Elton John. And then a girl did a gymnastics demonstration. A Koinonia member played jazz clarinet with a puppet and one of our counselors presented a spoken-word piece about environmental degradation. A girl from Tanzania sang “Man in the Mirror” by Michael Jackson and then another girl did a choreographed dance routine to a Japanese pop song. I told a traditional Jewish story about dreams, journeys, and treasure. There was drumming and piano and more singing. An impromptu dance group consisting of white, black and Latino boys taught us to dance the Whip and the Nae Nae. One of the quietest campers stood up to sing, but only got through the first verse before giving up in frustration and sitting down, head in his hands. I saw several of his fellow campers gather around to comfort him as the next act performed. Then at the very end of the show, our CIT, Lily, announced that he was going to try again. This time, this young man stood and beautifully sang “Stay” by Rihanna – a cappella! Guess who got the biggest applause of the night? I wish I had this type of community when I was 13. After the talent show, we all returned to the bunk house and did an activity that allowed each camper to anonymously recognize the strengths and gifts they see in their peers. And the winner of the talent show was…compassion, support, and friendship.